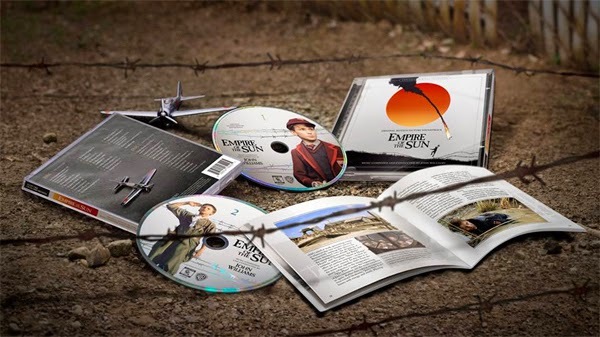 La-La Land Records, WEA and Warner Bros. proudly present the remastered and expanded, limited edition 2-CD set of John Williams’ Academy Award Nominated original score to the 1987 feature film EMPIRE OF THE SUN, directed by Steven Spielberg and starring Christian Bale, John Malkovich and Miranda Richardson. Heralded as one of the acclaimed composer’s finest works, Mr. Williams’ masterful orchestral score seeks no less than the openness of the human heart, mind and soul – the perfect compliment to this powerful and indelible film about a young English boy’s emotional and physical struggle to survive the Japanese occupation of China during WWII. This deluxe re-issue was produced, assembled and mastered by Mike Matessino in cooperation with John Williams, Steven Spielberg and the film’s co-producers Kathleen Kennedy and Frank Marshall. Disc 1 contains a full presentation of the film score, including never-before-released music, while Disc 2 pulls back the veil of the creative process with a selection of alternate cues and other additional music. A 28-page CD booklet features handsome art design by Jim Titus and Matessino’s exclusive, in-depth essay, approved by the director and composer. and other online soundtrack boutique dealers starting June 24, 2014. Hits it out of the park this week, this is coming today... it's a glorious score and needed an upgrade!